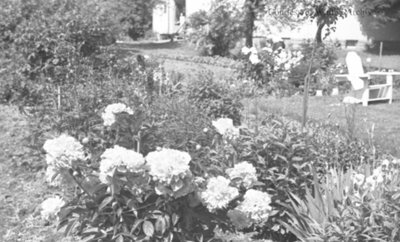 A black and white negative of a garden at Inverlynn. The house can be seen in the background. Inverlynn house was built at the intersection of Raglan and Giffard Street (1300 Gifford Street) in 1860 for William Laing (1818-1891). In 1870, the house was purchased by George McGillivray (1813-1894). Since 1870, the house has belonged to descendants of the McGillivray family. Garden at Inverlynn, June 1936, Marjorie Ruddy. Whitby Archives A2013_040_190A.